As you can probably tell, I have thoroughly enjoyed both books by this author. This one is chilling in many ways, and even the most steeled reader will cringe at a few points in this book. There are some nasty people out there and David Buschi has brought them to life in Proportionate Response. You’ll quickly wish he hadn’t…but once exposed, you can’t turn back. “I haven’t read two back to back books by the same author in years. 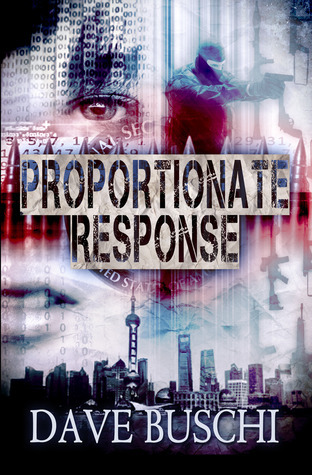 Dave Buschi’s second novel, Proportionate Response, ended this streak with a vengeance. I downloaded it immediately after finishing The Back Door Man and thought I would read a few pages. I was immediately sucked back into the fold for another incredible ride on Buschi’s techno-thriller bullet train. Buschi showed his talent for merging the technical world with the physical one in The Back Door Man. He takes this perfectly balanced game to another level in Proportionate Response. You’ll be quickly introduced to Marks and Lip (nicknames), two former covert operatives from an extremely secretive, techno-paramilitary branch of the NSA. The kind of branch that never existed. The action starts when their ex-NSA teammate’s wife shows up with a mysterious letter. Her husband has recently disappeared and left her with a set of very explicit directions. Directions that would put her in contact with Marks and Lips, while ensuring she couldn’t be tracked. They agree to meet in a Starbucks, a crowded, neutral location…a few minutes into the meeting, it becomes painfully obvious that they’ll have uninvited guests. Guests with bad intentions. The scene in Starbucks is incredible, as are all of the action scenes. Without spoiling any more of the fun, let me say that the action continues at break-neck speed from this point forward. As Marks and Lip start to unravel the mystery and conspiracy behind their ex-partner’s disappearance, the story descends into dark, unapologetic territory. The men sent to “meet” them at Starbucks are part of a hideous network operating on U.S. soil. Their discovery is not for the faint of heart. It’s utterly frightening…and it’s only the tip of the iceberg, as they soon realize. The master conspiracy propelling this novel forward is unlike anything I have encountered before. Within the framework of recent events, the plot is highly realistic and entirely believable. After doing some internet research on my own, I wouldn’t be surprised if it was already happening. Steve, thanks for the great review. Lip is going to be bummed, though. He was really hoping for a PG rating on this one. What am I going to tell him when they won’t let him in the theater? He’ll have to bring his mom as a chaperone. I have a feeling they see a lot of movies together. My pleasure as always. Great read…NC-17 at least.